If you’re a lucky owner of a dog, most likely you’d need to get a leash to walk together with it. 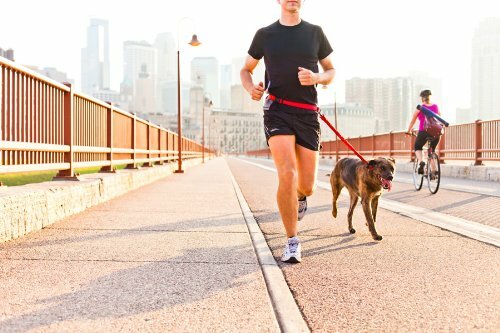 Consider our review of 5 trendy dog running leashes and choose the one that best suits your pet. The lead is accessorised with the LED lighting system for improved visibility in the dark and the Multi Box to keep your poop bags organised and within easy reach. With this 8-metre cord lead, you will enjoy a pleasant walk, giving your dog freedom of movement. Available in different lengths and colours. Zipped pouch, Adjustable length, Reflective cord, Ergonomic grip handle, Brake button, Swivelling hook, Customizable with LED lighting system and Multi Box. Barkswell dog leash has a special flexible bungee that absorbs the shock of sudden movements of your dog. The Barkswell hands-free lead will help make exercising an enjoyable experience forever! Halti’s reliable double-ended hooks on both sides of the lead with a D-ring allow you to adjust the cord length as per your training requirement. Halti running dog lead designed by Dr. Roger Mugford will indeed make the dog training procedure less labour intensive. These dog leashes come in different widths and colours. A few of its noteworthy features are Double-ended swivelling hooks and Rings for versatile length. GHB extendable retractable dog lead is strong enough to fully restrain large-sized dogs up to 50 kilograms in weight. With this high-quality and reliable lead, you and your dog will feel absolutely safe, even if your canine has the habit of frequently pulling on the leash. These dog running leash are available in 3 colours. It will be especially useful while accompanying your canine companion for walking and hiking exercises. With its adjustable length, ergonomic grip handle, swivelling hook and brake button, it is for sure that your dog will love you more for fetching it this wonderful product! An important highlight of Flexi retractable dog lead is its bright neon coloured cord with reflective stickers that ensures excellent long-distance visibility in the dark. Enjoy pleasant walking experience with your dog on this nice Flexi leash anywhere in squares, parks, and even at traffic intensive areas. But the only disadvantage is that the cord can tangle over time. Want more? Choose among 3 available sizes, depending on your dog’s breed. The leash is of neon colour and is made of high quality nylon material. It is of Flexi type and comes with a manufacturer warranty of 2 years.